Approximately two dozen UC Berkeley faculty will join the “99 Mile March for Education and Social Justice” on Friday, March 2nd. The march departs Oakland on Thursday, March 1st, and will arrive in Sacramento on Monday March 5th for a rally on behalf of public education at the State Capitol Building. More on the March Days of Action. Also check out Refund California. Community Colleges may get unexpected funding cut of nearly $150 million. Brian Barksky has more on the absurd costs and debt of the Cal Student-Athlete High Performance Center. Haas Business School is planning a $70 million expansion. They say Berkeley won't have to pay for it. Isn't that what they said about the SAHPC? Head of SEIU wants everyone to step aside in favor of Brown's tax proposal. He trots out tired "adult in the room" phrase even though Brown is more regressive than "Millionaires Tax" and might spend it more on corrections. 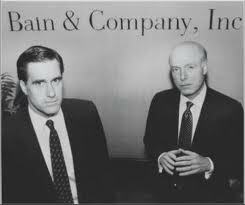 Oh, and the Millionaire's Tax polls better than Brown's at this point. Bob Samuels offers some thoughts on the Millionaire's Tax. Reclaim UC has a post on why to march and protest. Even Birgenau realizes he should support it and endorses the March 5 scheduled rally. We are not so sure about Edley. UC continues to try to sell inequality as its product; average compensation for grads from various UC campuses differ. Operational Excellence team lays out its vision for why they should destroy working conditions at UCB. I spoke at a half-dozen public university events over the past 10 days, in California (Irvine), Maine (Orono), New Jersey (New Brunswick), winding up back in California at a unique, collaborative event in Santa Barbara that brought a wide range of people together to redesign UC for 2050. Everywhere I went, great, dedicated public U people are fully engaged and ready to fight, and not sure whom to fight. Although the administrations (and some of the faculty) at UC Berkeley and UC Davis would clearly like for last fall's police violence to fade into the woodwork, it is unlikely they will get their wish. While everyone waits for the completion of Justice Reynoso's report (a wait that makes last week's faculty exoneration of Chancellor Katehi even more puzzling,) information about the events of fall—and independent efforts at accounting for them—move forward. First, as both the Daily Cal and the SF Chronicle have reported, Chancellor Birgenau and Executive Vice-Chancellor Breslauer did in fact discuss the police's use of batons against protesters on November 9th, despite Birgenau's later statement that they had not. As emails obtained by the ACLU reveal, Breslauer informed Birgenau about the use of batons against protesters; Birgenau moved past the information to declare that the protesters "want exactly such a confrontation" and instructed Breslauer that it was "critical that [they] not back down on [their] no encampment policy." Despite the insistence of University Berkeley spokeswoman Claire Holmes that she "doesn't think you can infer from the e-mails that [Bigenau was] authorized" it is clear that Birgenau considered sustaining the "no encampment" policy to be more important than stopping the use of batons on protesters. Indeed, while Birgenau did acknowledge that the situation was "really unfortunate" it is unclear what exactly he thought was unfortunate and indicates that the use of force against protesters was by no means at the top of his worries. 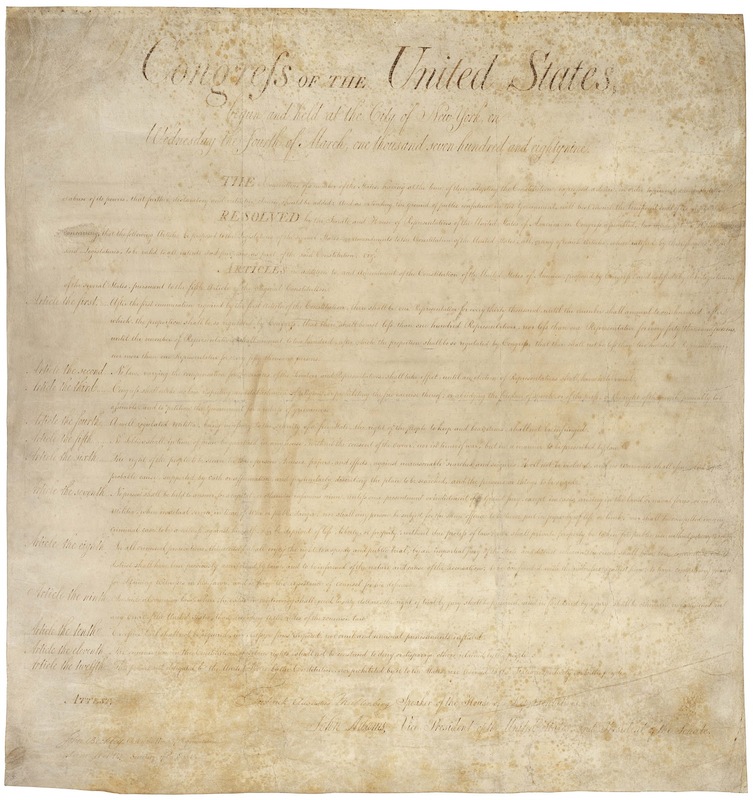 As the ACLU put it in their letter to Christopher Edley and Charles Robinson, "The University handled the students' peaceful protest as a threat to be eradicated, and not a form of debate and dialogue to be respected and fostered." It is hard to disagree with that conclusion. 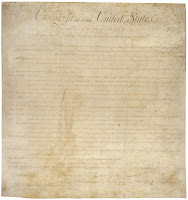 "a declaration from the Court that campus policies and practices that led to the abuse of the plaintiffs and others offend both the state and federal constitutional guarantees of the rights to free speech and assembly and that the pepper-spraying and arrests of plaintiffs violated their state and federal constitutional rights; an injunction to prevent repetition of such a response to a non-violent protest; and compensatory and punitive damages against the individual perpetrators of the illegal acts and their superiors who ordered, directed and/or condoned this outrageous conduct." One striking characteristic of our contemporary political culture is the insistence by those in power that we should only look forward, not backward. But as Glenn Greenwald and others have repeatedly pointed out, this refusal to take responsibility for the past serves only to absolve the power of their accountability and destroys the notion of the rule of law. Universities should not be places of forced forgetting, but of open and democratic problem resolution. It is a sorry state when students and others feel compelled to turn to Federal Courts to ensure their right to safely protest on UC campuses. My understanding is that Shared Services will be based on the Research Enterprise Services model. Many of the time-consuming functions are to be taken out of departments, including some of those that, due to their complexity, are least efficiently done at a local level. But SS will still need the same kind of information and reassurances; they will also have the same opportunity to misread our needs, postpone our processing when they get overwhelmed, etc. Much is being made of the term “service level agreement” in OE presentations. OE wishes to assure “customers” that they will continue to receive the level of service that they need, promptly and efficiently. I have been envisioning this in the form of a business contract: SS would handle the hiring needs of a mid-sized academic department, processing an estimated number of transactions per year, within the specified amount of time. An agreement would be drawn up between a department and a mid-level SS manager who has access to metrics and knows how many hiring transactions should be completed by one staff member in one day/week. Once the agreement is made, the pressure would be on the processing staff to get it done. If you learn to be efficient under pressure, hypothetically you will get your evenings and weekends back. 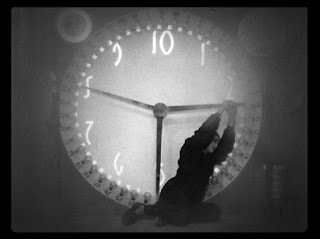 Of course, in real offices things happen: people get fired, people go on maternity leave, and important systems go down. Stuff happens! But I envision that the service level agreement would remain, and the pressure would be on the mid-level managers to see that the work gets done to the customer’s satisfaction. The tone at every meeting I have ever been to, even those sponsored by staff groups whose stated goals are greater efficiency and productivity on the part of campus staff, has had an undertone of suspicion and resistance. The Davis Senate concluded its vote Friday on the motion to declare non-confidence in Chancellor Katehi. The motion failed 697-312. 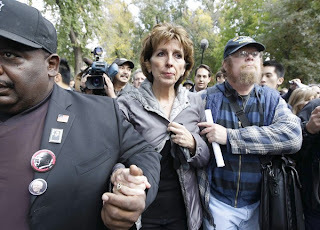 A second motion—the "five points" motion—that criticized the use of police force against the demonstrators but affirmed confidence in Katehi's responses to the police violence and her "impeccable performance of all her other duties" passed 586 to 408. UCOP declared itself "gratified" by the results. Clearly the Davis faculty is deeply split: about the campus leadership, about how to respond to the police violence, and about the general direction in which Davis is moving. Slightly more faculty cast votes on the clear no-confidence motion than on the "five points" motion; Katehi's support on the latter dropped over 100 votes. It is clear that the majority of the Senate Faculty are unwilling to break with the Chancellor. Beyond this, how Davis will respond in the future to Katehi or to the reports about police violence on campus is unclear. According to Amnesty International around 500 people have died in the last decade after being shocked by Tasers. Although A.I. is not claiming that all of the deaths were caused by Tasers (many were declared to have multiple causes) the large number of deaths following exposure to Tasers suggest that the common folklore of their safety and non-lethal nature needs to be reexamined in a serious manner. This issue is especially important for UC at the moment. 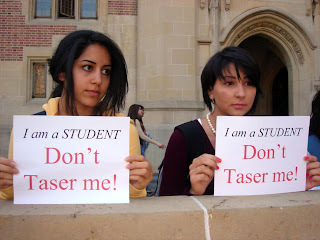 Although batons and pepper spray were the weapon of choice for the Berkeley and Davis police departments, Tasers have been used on several campuses and the insistence—on the part of their proponents—that they are safe has encouraged the possibility that their accepted use would be written into the new system-wide rules being promulgated under the direction of Edley and Robinson. As with other forms of weaponry, Tasers serve to further militarize campus police and transform them even more from officers of the community to officers against the community. As they say in the theater, if authors introduce a gun in the first act they will use it by the third. UC needs to find a way to maintain public safety without creating a dynamic that leads to violence in the third act. It is now 3 months since the cases of police violence at Berkeley and Davis. 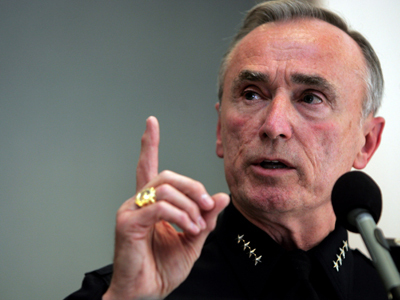 Although UC's senior managers expressed profound concern and promised accelerated investigations, one involving former NYPD and LAPD chief and Kroll chairman William Bratton, there have been no reports produced on the police or on the decisions behind them at either Berkeley or Davis. At Davis, investigators had problems gaining access even to police who were not involved in the violence, and they still have not received permission to speak to either the Police Chief or the officers being investigated. Meanwhile, the Davis administration spent $100,000 on a communications consultant to manage the messaging in the early days. The cost of the external investigations of the police is still unknown. Like their counterparts at Berkeley, faculty at UC Davis have successfully forced a Divisional vote on a no-confidence motion. And as at Berkeley, this effort has triggered a series of counter-motions that may cloud the issue considerably. The original motion of no-confidence in Chancellor Katehi is here and a motion of in opposition to police violence is here. There is also a counter-motion that condemns the police action but praises Katehi. It can be found here. David Copp has offered an analysis of the motion that blames the police and praises the Chancellor. David Wittman offers his analysis of the situation facing Senate members. The Voting closes Friday, the 17th at 5 P.M.
Stanford University has announced that its recently concluded fundraising campaign brought in $6.2 billion in gifts. The new money added about $900,000 per enrolled undergraduate ($400,000 per enrolled student) on top of the world's already fifth biggest university endowment ($16.5 billion in 2010-11). At the 5% payout the federal government wants to see as a floor for non-profit endowments, this new money would yield around $310 million per year, or around an additional $20,000 per year per enrolled student. Meanwhile, at the University of California, the state gives about $9,800 (UCOP says $7,570) for each of UC's 231,000 students enrolled in the fall of 2011 (on $2.27 billion in state general funds [p 3]). The Daily Bruin had a sad story today about a student offering UCLA an additional $8.33 a month from his coffee money. 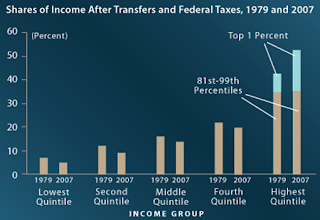 Administrative hand-wringing over access has been focused on the giant hole in the income donut where dwell "middle class" students with family incomes of between around $80,000 and $150,000 per year. For example, UC President Mark Yudof recently assured the anti-tax California Chamber of Commerce that UC's Blue and Gold plan makes UC tuition free for all students with family incomes under $80,000, effectively covered the $1,890 tuition increase in 2011-2012 for families making under $120,000, and in general makes average net tuition at UC only $4,000, or about a third of the current sticker price. In December, UC Berkeley announced a Middle Class Access Plan (MCAP), designed to help those same Middle Earth students with family incomes in the $80,000-140,000 donut hole. 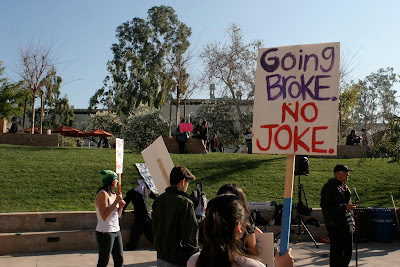 So why, when I was at UC Riverside to give a budget talk three weeks ago, were students trying to show the Regents signs like this? This chart is from the College Board's Trends in Student Aid 2011. 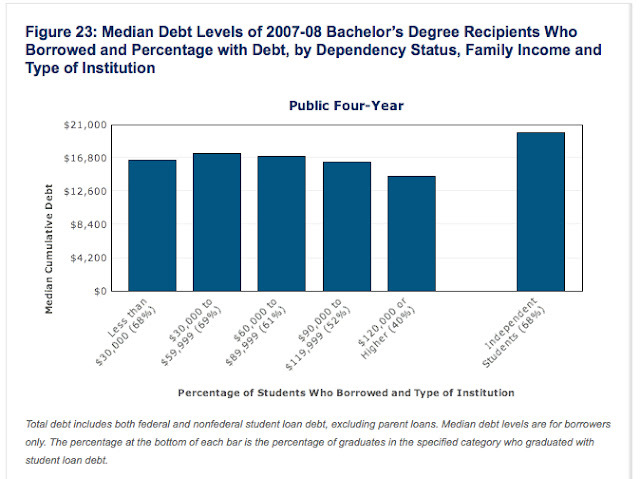 It shows that low-income students borrow almost as much as do middle-class students. In 2008 low-income Pell Grant students, who in some accounts have it good, "had an average debt of $24,800—nearly $2,000 more than the average for all seniors graduating with loans." The authors of Crossing the Finish Line, with their uniquely comprehensive data base, confirm this pattern and show that students from the bottom income quartile increase their annual borrowing by 50% from their first to their last year in college (chapter 9). Low-income students are going broke as fast as middle-income students. Actually, given their lower income base, they're going broke even faster. What about all that grant income that supposedly wafts poor students along? It doesn't close the funding gap between financial aid for tuition and related expenses and the overall cost of attendance. As background, take Berkeley's MCAP plan, which estimates Berkeley's cost of attendance as $32,000 per year. In the new scheme, a student from a family grossing $80,000 pays net tuition of $8,000 and the family contributes a maximum of 15% of their gross income or $12,000. The university comes up with the missing $12,000 ($4,000 coming from the existing return-to-aid program). And yet the student and her family still pay $20,000 a year—a quarter of their gross income. This requires the borrowing that appears in the College Board's data. Median family income in California was not quite $55,000 in 2010 (slide 9). Let's say that a student from this median family—certainly not technically poor—has all tuition covered through a partial Pell Grant combined with a Cal Grant (at least until Jerry Brown messes with it again.) This saves another $8,000. The student and her median family then need to find $12,000 per year. Factor in this family's net income in relation to California mortgage or rent costs and just one other child in the family and their capacity to contribute disposable income rapidly approaches zero. A student borrowing $4,000-5,000 per year for four or five years will rack up the total debt seen in the chart. 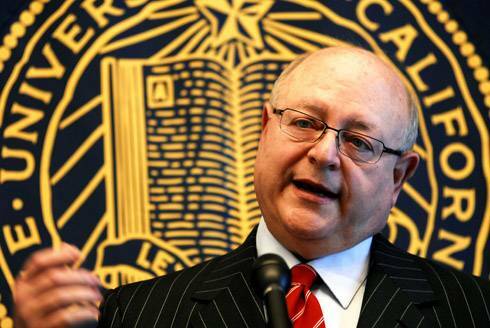 UC President Mark Yudof recently noted the debt figure for UC is close to $20,000. When public university officials claim that access for low-income students is guaranteed by grants, they wrongly omit the overall cost of attendance. This may have the negative effect of reducing public interest in fixing the whole access problem. The LAO also opposes the budget: they don't like Brown's plan to promise increases for higher ed if his tax plans are successful. Speaker Perez has a plan to aid middle-students in Higher Ed, but does he stand a chance to get the Republican votes he needs? Think you understand the demographics of the community college population? Think again. Pennsylvania governor seeks to slaughter public higher Ed. Charlie Schwartz has a new piece on how to read university budgets. Reclaim UC has a new flyer on privatization and race, and class inequalities. Mark Yudof tries to explain how really there is no great debt burden for UC students. No, it is not convincing. UC may borrow money to lend to the State. Bob Samuels reflects on Mark Yudof's response to President Obama's education initiative. Yudof seems to be making the rounds as he talks here as well. Students at Berkeley Challenge Edley and Robinson: Why Have an Armed Police Force on Campus? 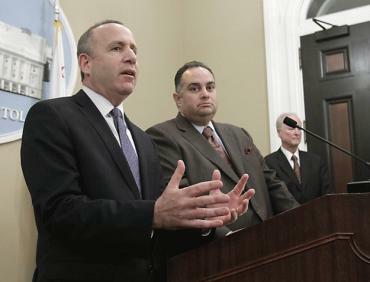 The California Budget Project has a new study of the deep effects that the recession and budget cuts in California have had on women and families. Catherine Liu was interviewed on Left Business Observer about her book American Idyll.